When I first started this blog, I wanted to create a platform where I could store my favorite recipes, and share them with friends and family. Little did I know that I would be introduced to a large community of Iranian foodbloggers and writers who continuously inspire me with their enormous talent and knowledge of the Persian cuisine. This blog post is another collaboration with my foodie friends. 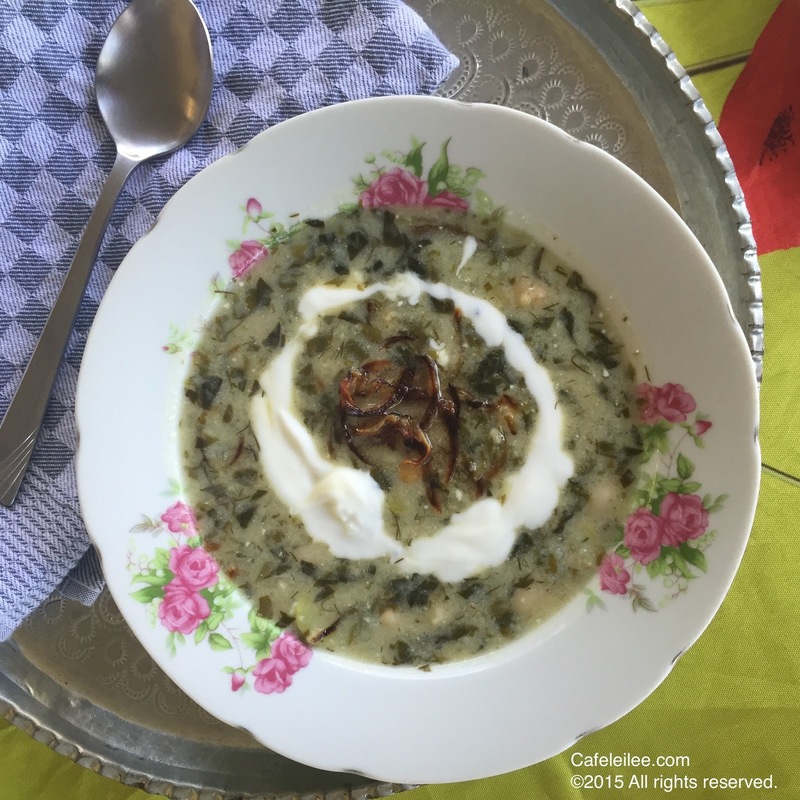 I decided to post a recipe for a soup that a reader had requested, my late grandmother's Mazandarani style yogurt soup perfumed with fresh herbs and hearty for a chilly autumn weather. Funny that today as I'm writing this blog post we got our first autumn rain in California. Hopefully the rain season is off to a good start. In a large skillet heat 1/3 cup of vegetable oil and fry onions until brown. Set aside. In a large pot bring 2 quarts (2 liters) of water to boil and cook the chickpeas and white beans on a low simmer covered. If you want your soup thicker, add rice the same time as legumes. If you want your soup on the thin side add the rice after the legumes have cooked. Once the legumes and rice have cooked through, add chopped herbs and garlics and let the soup simmer for about 30 to 45 minutes. About 10-15 before serving, add the fava beans. In a large bowl beat the yogurt until smooth. Once the fava bean is cooked remove the soup from the stove, add the soup one ladle at a time to the yogurt and mix in (tempering the yogurt this way prevents the yogurt from curdling). Reserve some of the fried onion and mix in the rest. Serve the soup with the remaining fried onions on top. Oh yum! I love this soup, there is an Azeri version of this without the fava beans. I want a bowl of this right now. Happy Mehregan. Yes, this California weather is not what I would consider to be fall-like. Your soup looks amazing. I love all these variations of yogurt soup that I've never seen before. This sounds so yummy! And I loveee fava beans! We're yogurt soup sisters today! <3 Here's to a wetter California season! My grandmother was from Mazandaran and made certain dishes that are uniquely regional. This sounds lovely. I don't remember her making this, but I certainly will. Thanks for sharing and happy Mehregan! I love this aash! With all that herbs, addition of fava and yogurt, yum, yum, yum. Thank you for the recipe! It seems so tasty shoup, Thanks for sharing these all photographs with us, good guide keeps sharing. Very Tasty Soup, I want to check this Soup taste.